Would you like professional instruction and advice on your performance for this year’s All-State vocal or string competition? The Patel Conservatory and the University of Tampa will host two free workshops to help students prepare for the All-State competition. If students are selected at the All-State competition they will be given the opportunity to perform at the Florida Music Educators Conference and work with esteemed music professionals. The string clinic will be Sat., Sept. 14 for students who play the violin, viola, cello or bass. 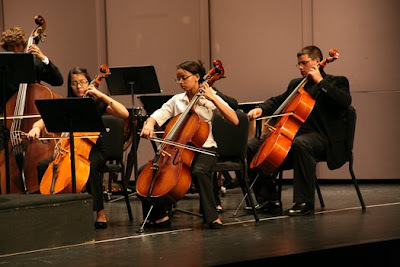 Students will receive help from professional teaching artists from the Patel Conservatory, the University of Tampa and The Florida Orchestra. The vocal clinic will be on Sat., Sept. 21, 2013. Students will work with professionals who teach private voice lessons, choir, music theory and musical theater courses at the accredited Patel Conservatory. Pick up tips on sight-singing, vocal technique, auditioning and the musicianship exam, and even rehearse one of the All-State pieces before the September 23 exams. Students will be further prepared to face the All-State judges after attending this workshop. Free tours of the Straz Center and the University of Tampa will also be available for those interested in learning more about their music programs. Middle school students: 8 to 10 a.m.
Grades 9 and10: 10:30 a.m. to 12:30 p.m.
Grade 11 and 12: 2:30 to 4:30 p.m.
High school students: 12:30- 2:30 p.m. Both clinics are free, but RSVP is required. Please RSVP by calling the Patel Conservatory registrar at 813.222.1002.